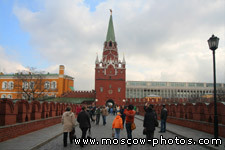 The Moscow Kremlin is a symbol of Russian statehood. It is one of the largest architectural ensembles in the world and boasts a rich treasury of historical relics and cultural monuments. It is located on Borovitsky Hill, where a Slavic settlement arose at the turn of the 12th century from which the city originated. As Moscow developed, the appearance and significance of the Kremlin changed. By the end of the 15th century the Kremlin had become a fortress-city within Moscow, the residence of the country's state and religious powers. It even retained its value as Russia's national sacred place during the 18th and 19th centuries, after it had ceded its role of capital city to St. Petersburg. In 1918, Moscow became the capital again, and the Kremlin was where the supreme bodies of power governed the country from. The Kremlin's special status drew the leading Russian and foreign master craftsmen to participate in creating its artistic and architectural ensemble. Powerful walls and towers, the magnificent Cathedral Square, the golden-domed churches, and the czar's mansions and palaces determined the Kremlin's appearance throughout the late Middle Ages. During the 18th to 20th centuries, new palaces and large administrative and museum buildings were erected. 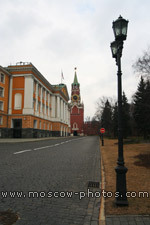 They embodied the creative searchings of their era and significantly changed the appearance of the old Kremlin; however, it remained unparalleled in terms of its uniqueness and national identity. Today, the Kremlin is the residence of the Russian President. Moreover, it has been proclaimed a protected area and included in UNESCO's List of the World Cultural and Natural Heritage. 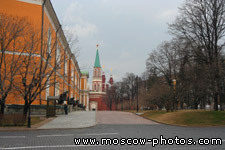 On its grounds is the Moscow Kremlin State Museum of History and Culture. 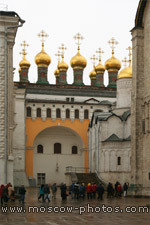 The museum includes the Armory, the Cathedral of the Assumption, the Cathedral of the Archangel, the Cathedral of the Annunciation, the Church of the Deposition of Our Lady's Robe, the Patriarch's Palace with its Church of the Twelve Apostles, the Ivan the Great Bell Tower ensemble, the cannons, and the Kremlin bells. 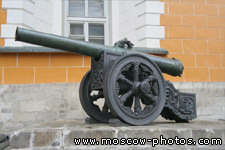 The famous Czar Cannon, the pride of the museum's artillery collection, was cast by well-known Russian founder Andrei Chokhov in 1586. 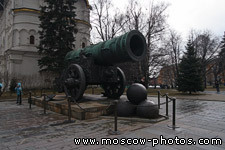 The cannon is 5.34 meters long, has an inside diameter of 890 mm, and weighs 40 tons. 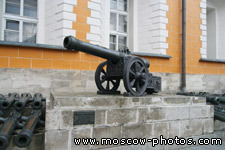 The old ordnance was mounted on a gun carriage made for it in 1835. Hollow cast iron decorative cannon balls were made for it at the same time. 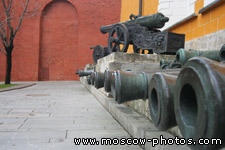 Cannons of the 16th to 19th centuries from the museum's artillery collection are lined up along the front of the Arsenal building. 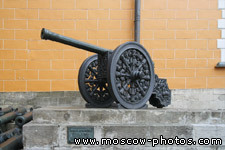 Of particular interest are 40 cannons of Russian and foreign manufacture of the 16th to the early 18th centuries. 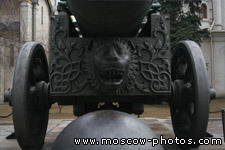 Their cast iron decorative gun carriages adorned with ornaments and heraldic designs were cast in the 19th century. The majority of the collection consists of more than 700 cannons made in France and several other European countries in the late 17th century to the early 19th century. Many of them were captured by the Russian army during the Patriotic War of 1812, including the historic Battle of Borodino. 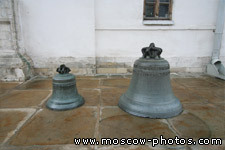 The Czar Bell was cast in 1733 to 1735 by Moscow craftsmen Ivan Motorin and his son Mikhail. The giant bell is 6.14 meters high, 6.6 meters across and weighs 200 tons. 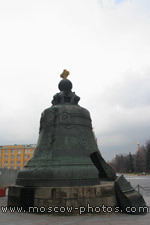 During the fire in 1737, the Czar Bell was still in the casting pit on Ivan Square. Uneven cooling caused it to crack, a chunk of 11.5 tons breaking off. 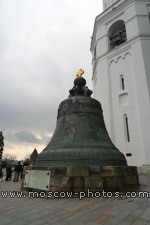 In 1836, the bell was set on a pediment for viewing. The Cathedral of the Assumption was built by Italian architect Aristotle Fioravanti between 1475 and 1479. Its construction initiated work on the architectural ensemble of Cathedral Square. Ceremonies of national significance took place in the Cathedral of the Assumption: elections of grand dukes, coronations, and consecrations of heads of the Russian Orthodox Church. 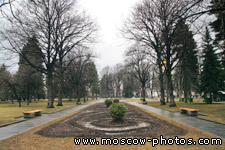 It was the burial place of the metropolitans and patriarchs. 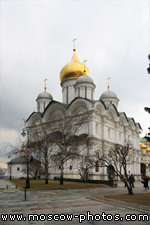 During the 18th and 19th centuries, the Cathedral of the Assumption retained its value as Russia's main cathedral where the emperors and empresses were crowned. The most prominent craftsmen of the time decorated the interior of the cathedral, which played a tremendously important role in the life of the state. Fragments of frescoes which were painted at the watershed of the 15th and 16th centuries, most probably by painters in the milieu of the famous painter Dionysius, have been preserved intact on its altar screen. The main ensemble of the wall frescoes was created in 1642-1643 by Russian painters led by Ivan and Boris Paisein. The cathedral's iconostasis, which dates back to 1653, is of great artistic and historical value. For many centuries, icons were brought to the Cathedral of the Assumption or painted especially for it. 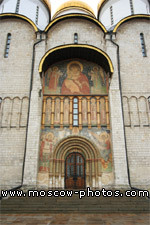 Among the masterpieces of old Russian painting kept in the cathedral are the icons: "St. George," which is traced back to the turn of the 12th century; "Our Savior of the Fiery Eye," produced in the 14th century; "Assumption of Our Lady," going back to the 15th century; and the hagiographic icon "Metropolitan Peter," created in the late 15th and early 16th centuries by Dionysius' milieu. The so-called Throne of Monomachus, the czar's prayer place made for Czar Ivan the Terrible in 1551, is a unique memorial of Russian history and artistic woodcarving. 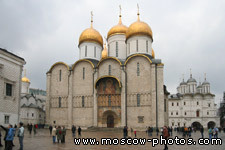 The Cathedral of the Archangel was built in 1505-1508 by Italian architect Aleviso Novy. It served as the sepulcher of the Moscow grand dukes and appanage princes, and then, right up until the early 18th century, of the Russian czars. There are 47 tombstones and two shrines in the cathedral's unique dynastic necropolis. Here lie the remains of Moscow's grand dukes Ivan Kalita, Dmitry Donskoi, Ivan III, Czar Ivan IV (the Terrible), his son Czarevitch Dmitry, and the first czars of the Romanov dynasty. 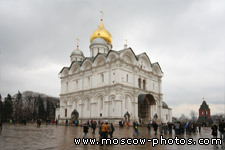 A visit to the Cathedral of the Archangel and worship of their ancestors was a mandatory part of all the solemn ceremonies held by the royalty in the Kremlin. The frescoes of its interior depict scenes associated with the cathedral's designation and were painted in 1652 to 1666 by Russian craftsmen. The compositions on the southern and northern walls of the cathedral tell of the deeds of the Archangel Michael and his angelic warriors. The bottom tier of the wall paintings displays full-size portraits of the Moscow grand dukes and appanage princes buried in the cathedral, and the columns show their ancestors: Kievan Prince Vladimir and Princess Olga, Andrei Bogolubsky, Alexander Nevsky, and his son Daniil, the founder of the Moscow ruling dynasty. The cathedral's Portrait Gallery, which includes more than 60 historical figures, is an interesting specific of its frescoes. The cathedral's high four-tier iconostasis was created during the second half of the 17th century. Its bottom tier includes the icon "The Archangel Michael and His Deeds" of the turn of the 15th century, a rare memorial of old Russian art of the era of the Battle of Kulikovo against the Tatars in 1380. The Cathedral of the Annunciation, built by Pskov craftsmen in 1484 to 1489, was the private home church of the Moscow grand dukes, and later of the Russian czars. The northern and western galleries of the cathedral served as the main entrance to the royal palace. The cathedral is a rare architectural monument which fully preserves the monumental art of the mid-16th century. The gallery's arches display the composition of "The Jesse Tree," the biblical descendants of Christ, which includes figures of the prophets and ancient philosophers. In the central part of the cathedral are scenes from the Apocalypse, the prophesy of the end of the world and the Last Judgment. Russian princes are also shown here, as well as the Byzantine Emperor Constantine and his mother Helen. The cathedral's iconostasis is of great value; it combines the icons of various periods from the 14th to 18th centuries. Some researchers believe that the deesis icons were painted at the turn of the 15th century by Theophanes the Greek, and some of the icons of the festal tier by the greatest Russian artist of the Middle Ages, Andrei Rublev. The local tier of the iconostasis contains a "Four-Part" icon, one of the most fascinating icons created by Pskov artists in the mid-16th century. 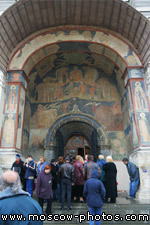 The cathedral's southern gallery displays the works of the Moscow icon-painting school of the 14th to 16th centuries. These include the early 15th century icons "The Martyr George" and "The Martyr Dmitry." The iconostasis of the annex, Synaxis of the Archangel Gabriel, is also on display in the gallery. Finally, a number of 16th century sanctuary crosses are exhibited here as well. 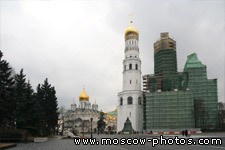 In the old basement of the Cathedral of the Annunciation is an exhibition, The Archeology of the Moscow Kremlin, which tells of the early pages in the history of Moscow and the Kremlin. 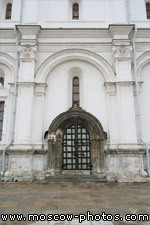 The Church of the Deposition of Our Lady's Robe built by Pskov craftsmen in 1484-1485 was the home church of the Russian metropolitans, and then of the patriarchs. According to legend, in the 5th century, Our Lady's Robe was brought to Constantinople from Palestine. It was believed to protect the city from enemies; therefore, the celebration of the Deposition of Our Lady's Robe was a particularly holy day in old Russia. The small cozy interior of the church suits its designation. The iconostasis and wall frescoes form a single artistic ensemble. Most of the icons, including "The Trinity," were painted in 1627 by court painter Nazary Istomin Savin. The church icon, "Deposition of Our Lady's Robe," is an enchanting piece of early 17th century iconography. 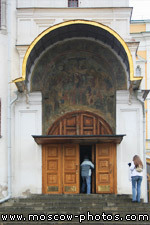 The church's frescoes were painted in 1644 by the royal painters, Sidor Pospeev, Ivan Borisov, and Semeon Abramov. Their themes illustrate legends from the life of Our Lady and Acathistus, a solemn hymn sung in praise of Our Lady. The church gallery houses an exhibition, Russian Wooden Sculpture of the 15th to 19th Centuries. Only a few items of this type of art have been preserved, and each of them is of great interest and value. "St. George," made in the late 14th or early 15th century, is the oldest sculpture displayed. Of the 17th century treasures, the icon "St. Nicholas of Mozhaisk" and the high relief "The Calvary with Robbers," produced by Armory craftsmen, are the greatest attractions. The Patriarch's Palace was built for Patriarch Nikon by craftsmen Alexei Korolkov and Ivan Semenov in 1653 to 1655. On the first floor of the palace were various services, and on the third floor were the personal chambers of the Patriarch: the Small Cross Chamber, dining-room, bedroom, office, and library. The second floor was for celebration purposes. Here were the Grand Cross Chamber, where assemblies of the Holy Synod were held and feasts were organized in honor of the czar and foreign guests, as well as the home Church of the Twelve Apostles with a refectory. Today, an exposition is displayed in the rooms of the second floor, its exhibits bearing the characteristic traits of the Russian culture and life in Russia in the 17th century. It displays the personal belongings of Patriarch Nikon and other heads of the Russian Orthodox Church, valuable and daily tableware, jewelry, a collection of pocket watches and clocks of the 16th and 17th centuries, rare specimens of embroidery, interior decorations - furniture, portraits, as well as books published in Russia before the 18th century and manuscripts, among which is a handwritten school primer by Karion Istomin, created by the author especially for Czarevitch Alexei, Peter the Great's son. The Church of the Twelve Apostles is adorned by an iconostasis of the late 17th century. 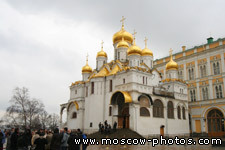 Its gilded carved decor is one of the best specimens of Muscovian baroque. It displays icons which provide the opportunity to trace the development of old Russian painting throughout the entire 17th century and become acquainted with the works of the famous royal painters, Simon Ushakov, Kirill Ulanov, Feodor Zubov, among others. 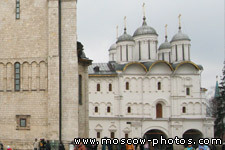 The Ivan the Great Bell Tower ensemble was formed over the span of two centuries. The bell tower was built in 1505 to 1508 by Italian architect Bon Friasin. A century later, another tier was added to raise its height to 81 meters. This is mentioned in the inscription under the cupola, which contains the date, 1600, as well as the names of Czar Boris Godunov and his son Feodor. In 1532 to 1552, a church, designed by Italian architect Pctroch Maly, was built next to the bell tower, and at the end of the 17th century it was converted into an Assumption Belfry. In 1624, a belfry with a tent-shaped roof, the Philarct Annex, was placed right next to it by Bazhen Ogurtsov. In 1812, when Napoleon's troops were retreating from Moscow, they blew up the bell tower ensemble, but the Ivan the Great Tower survived. The belfry and the Philaret Annex were destroyed completely; however, in 1814-1815, they were restored in full. Today, 24 bells from the 16th to 19th centuries hang in the bell tower and belfry. On the first floor of the Assumption Belfry is an exhibition hall, where works of art both from the Kremlin collection and from other Russian and foreign museums are displayed.